Short lead (254 out of 250 characters): Can technology remove today’s ceilings? Could it move everyone to the top of the pyramid by making everyone knowing and powerful, with the world’s best abilities? We will build a digital planet. What if we accelerate that into the present, to benefit us? Long lead (410 out of 400 characters): Our growing Crisis of Success comes from who we are: Everyone wants it all, wants it now, and won’t stop. But our problems are opportunities to use new tech to remove our ceilings. Expandiverse Tech adds a leap-ahead fast finish: Move everyone to the top of the pyramid by making everyone knowing and powerful, with the world’s best abilities. Stop thinking about our limits and start wondering what we can do. 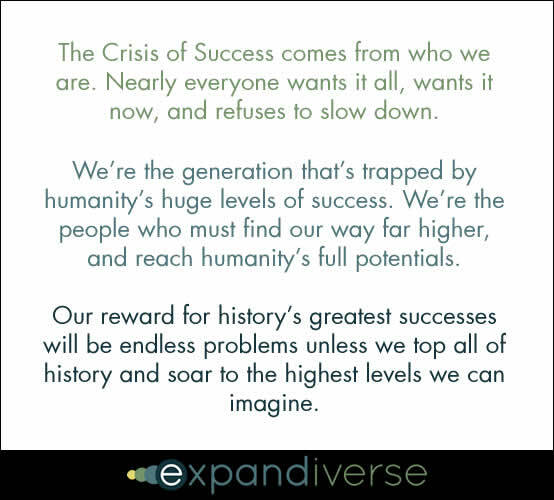 Our growing Crisis of Success comes from who we are: Everyone wants it all, wants it now, and won’t stop. But our problems are opportunities to use new tech to remove our ceilings. Expandiverse Tech adds a leap-ahead fast finish: Move everyone to the top of the pyramid by making everyone knowing and powerful, with the world’s best abilities. Stop thinking about our limits and start wondering what we can do. We’ve discovered an astounding secret. Our greatest achievement is the source of our biggest problems. These problems come from who we are: Nearly everyone wants it all, wants it now, and refuses to slow down. A sweeping redirection can’t be made in time. We don’t want to rebuild the world we have, because it’s the world we want. More people want more of everything, not less. The more we all succeed, the bigger we make our coming problems. We’re racing against the crises we keep creating. The biggest “Crisis of Success” is us. And we’re proud of ourselves. That puts us on the hero’s journey. We’re driven to face ourselves even when we don’t want to. The old ways and old thinking got us here. We have no choice but to test our limits and find a new ways to succeed. We’re the generation that’s trapped by humanity’s huge levels of success. We’re the people who must find our way far higher, and reach humanity’s full potentials. To emerge triumphant we must join history’s greatest heroes. We’re driven into our nexus by our self-inflicted doomsday. And we have to do it quickly. Our reward for history’s greatest successes will be endless problems unless we top all of history and soar to the highest levels we can imagine. Can technology remove today’s ceilings? We’re the people who create these crises. We’re the people pushing the Earth to its breaking point. Asking us to fix ourselves could be more of a comedy than a hero’s journey! Unless we don’t have to give up our problems. Unless there’s a new way to outgrow our impacts. It’s not enough for 200 or 2,000 people to work on a problem. What happens to a problem when 2 million or 20 million people work on it? What happens when solutions are automatically delivered as optional Active Knowledge to 200 million or 2 billion people? What happens when the metrics from our resulting actions are gathered, reported, and optimized so the strongest successes rise to the top of the Active Knowledge that’s delivered next? What happens when the best results are continuously measured, and better solutions are continuously surfaced and distributed in an advancing global wave? With Expandiverse Technology, everyone connected can help create and receive the world’s best knowledge so they can perform at higher levels, regardless of their education level. It’s a new kind of lever. Technology that helps everyone, gives us new ways to interact, to solve problems, to get ahead. To enjoy life in an increasingly successful world. 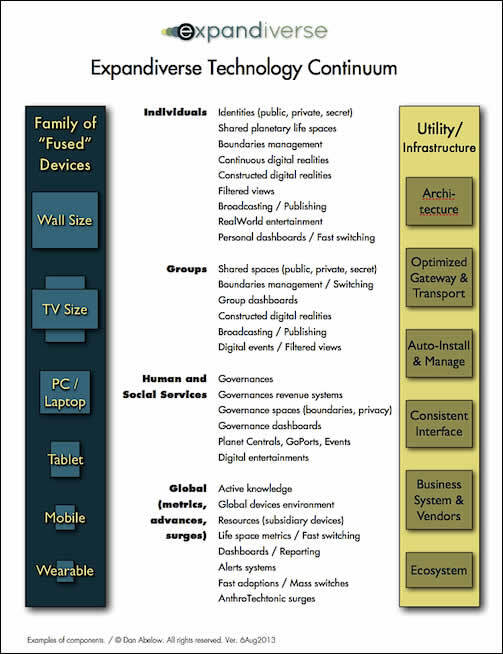 The Expandiverse has a new word for this evolution — AnthroTechtonics: “Anthro” for people, “tech” for technology, and “tectonics” for shifts large enough move the Earth. As we gain new kinds of continuous connections and interact, we will connect many new pieces and solve the next great puzzles. We will decide how our pieces fit together, and what our future can be. We will decide what to apply, and we will see if it works or not — and if we want to share so others can use it. Stop thinking about our limits. Start wondering what we can do. 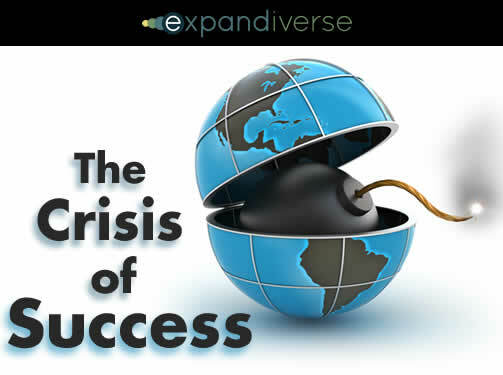 Until now, the world’s Crisis of Success have been impossible to solve. Current thinking takes us deeper. New technology didn’t exist. But as today’s world turns digital, we can start using this new technology to interact and advance with new speed, scope and skills. Instead of this taking decades, Expandiverse Technology includes a potential timeline to get up to speed in one decade. Today, leading companies and startups could supercharge their products and services. They could create new conditions for everyone to ignite their personal and group digital engines. They could gain “first mover” competitive advantages and capture markets. That could accelerate the future into the present, for the benefit of today’s generation. Even if not done right away, this advance is now available. It could be triggered by a large crisis (in a fundamental area like energy, food, water, climate, social unrest, etc.). That could accelerate its development and provide a “rapid progress” opportunity to become a far more capable digital world. However it happens, it will happen. Today’s Internet child will grow into an adult Digital World. The journey to our full potentials has begun. Like it or not, our generation is about to become tomorrow’s heroes. © Copyright 2014 Dan Abelow. All rights reserved. Image credits: Author photograph by Joseph Cristina. The second and third graphics are copyright Dan Abelow. All other graphics are credited to Shutterstock. The Expandiverse has a new word for this evolution — <b>AnthroTechtonics:</b> “Anthro” for people, “tech” for technology, and “tectonics” for shifts large enough move the Earth.